In his prophetic book Blowback, published before 9/11, Chalmers Johnson warned that our secret operations in Iraq and elsewhere around the globe would exact a price at home. Now, in a brilliant series of essays written over the last three years, Johnson measures that price and the resulting dangers America faces. Our reliance on Pentagon economics, a global empire of bases, and war without end is, he declares, nothing short of "a suicide option." 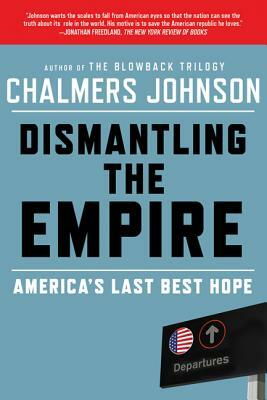 Dismantling the Empire explores the subjects for which Johnson is now famous, from the origins of blowback to Barack Obama's Afghanistan conundrum, including our inept spies, bad behavior in other countries, ill-fought wars, and capitulation to a military that has taken ever more control of the federal budget. There is, he proposes, only one way out: President Obama must begin to dismantle America's empire of bases before the Pentagon dismantles the American dream. If we do not learn from the fates of past empires, he suggests, our decline and fall are foreordained. This is Johnson at his best: delivering both a warning and a crucial prescription for a remedy.